KANSAS CITY, Mo. — Andy Reid has always been considered an offensive-minded head coach, whether it’s because he played along the offensive line in college or tutored the likes of Brett Favre once he reached the NFL. So his response wasn’t all that surprising this week when the Kansas City coach was asked who generally comes out on top when a potent offense goes up against a shutdown defense. Well, points might be at a premium even for the Chiefs‘ potent attack Sunday, because Reid and Co. are getting precisely what he was asked about: The Baltimore Ravens are rolling into Arrowhead Stadium boasting the league’s top-ranked defense for an intriguing matchup between playoff contenders. The AFC West-leading Chiefs (10-2) are tops in the NFL in scoring at 37 points per game. They also lead in yards per play and are third in yards passing and in the top five in most other categories. The Ravens (7-5), who are a game back of Pittsburgh in the loss column in the AFC North, allow a league-best 17.8 points per game. They’re also No. 1 in total yards, second in yards passing and third in yards rushing. Their 35 sacks also rank among the best in the NFL. As for the Chiefs, their focus can return to what happens on the field. They were preparing for last week’s trip to Oakland when video surfaced that showed star running back Kareem Hunt assaulting a woman in a hotel hallway in February. By the time they took the field 48 hours later, Hunt had been released and Spencer Ware had taken over as the starter in a 40-33 victory. Now, the veteran running back will have a week’s worth of work as their No. 1 running back behind him, and just in time to face the Ravens and their rugged defensive front. The Ravens have likewise become a ground-oriented attack with elusive Lamar Jackson under center and the emergence of Gus Edwards at running back. They’ve had at least 200 yards rushing in each of their past three wins, becoming the first team since the 2000 Jaguars to accomplish that feat. Harbaugh was hired in 2008 by Ray Rhodes and retained when Reid took over as Philadelphia’s coach in 2009, working first with special teams and then with the secondary. Harbaugh and Reid went to a Super Bowl together with the Eagles in 2004, before Harbaugh left for Baltimore in 2008. When Jackson runs the run-pass option, he’s got plenty of backs from which to choose. Edwards has been receiving the majority of carries lately, though his string of 100-yard games ended in Atlanta in part because Kenneth Dixon and Ty Montgomery combined for 11 attempts. Dixon ran for 37 yards, but he also had one of the Ravens’ four fumbles in the game. Chiefs safety Eric Berry could make his season debut after hurting his heel early in training camp. He never landed on injured reserve, but the Chiefs held their star playmaker out of action until coming back from their bye last week. He didn’t play in Oakland, but he now has two weeks of practice under him and Reid said it is possible that he’ll be active Sunday. The Chiefs signed former running back Charcandrick West to provide depth after Hunt’s release, and don’t be surprised if he is active Sunday. West is familiar with the offense, and he is excellent as both a pass-catcher and blocker in the passing game, making him useful against the Baltimore defense. 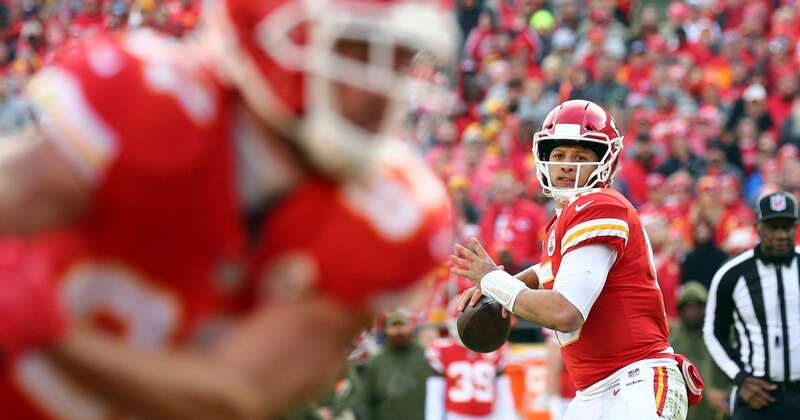 Freezing temperatures are expected Sunday, and some wonder how Chiefs quarterback Patrick Mahomes will respond. He played collegiately at Texas Tech, and the bye coupled with a trip to Oakland the past few weeks means his experience in frigid weather is limited.